Update: We have now heard of four tourists who died while out on desert tours at the same time as us – three from hypothermia and one from carbon monoxide poisoning. 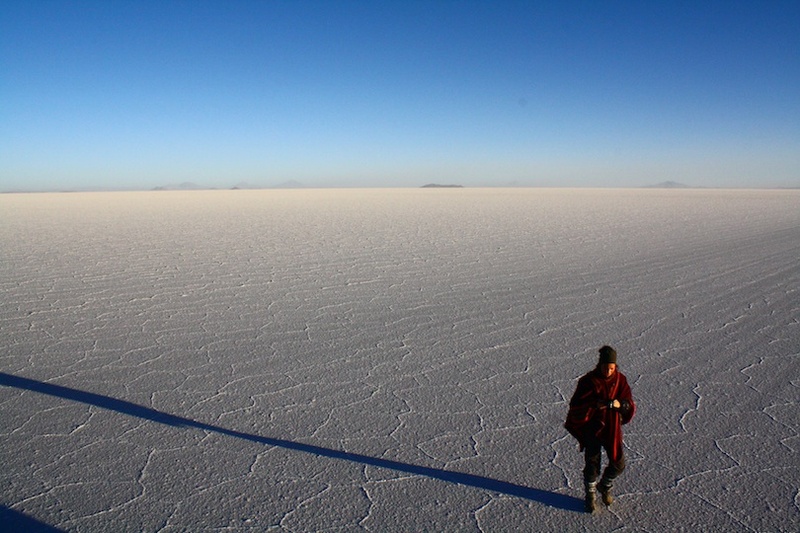 Uyuni: I’m writing this by candlelight in a small dark cell that’s big enough to accommodate a bunkbed and our backpacks but not once the door is opened, a logistical challenge that we meet by wrestling our filthy bags onto or off the lower bunk every time we need to use the door/bags/bed. I’m wrapped up in 3 hats, all my thermals, woollens, coats and scarves, yet still I’m freezing. Outside, a screaming typhoon is lashing through the town. The air is opaque with dust and flung stones, the town is boarded up but windows are still smashing. It’s impossible to leave our room, so we stay until our candle burns out. There has been no power for days and now the taps are also dry. 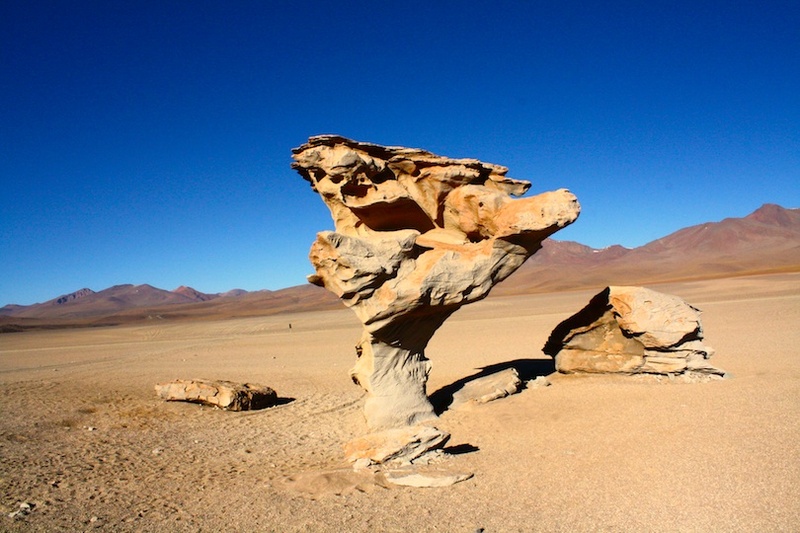 Uyuni is a desolate, windswept outpost at the best of times. Its exposed location was chosen deliberately when the town was founded in 1889 as a pitstop for trains between Argentina, Chile and the Bolivian mines north of here: a sheltered site at the foot of a mountain would leave the silver-laden train carriages easy prey for robbers (and this was 20 years before that errant mormon Butch Cassidy and his wonderfully named mate even made it to Bolivia). 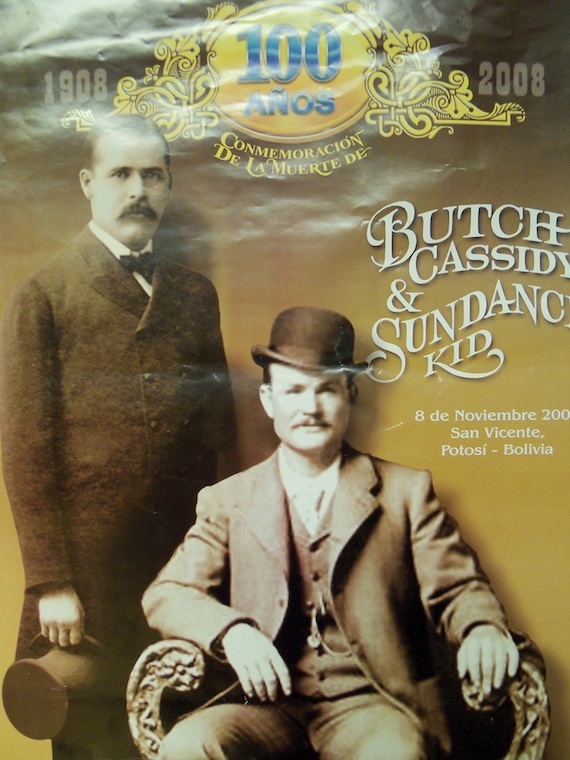 Butch Cassidy & The Sundance Kid were shot near here. There's a large reward for their guns which were never recovered. 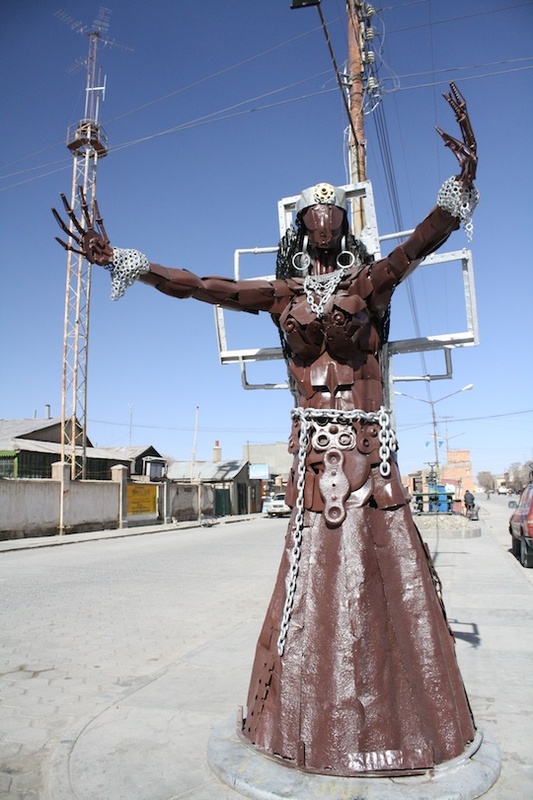 The town is 3670 metres above sea level and the extreme cold reportedly prevented epidemics breaking out among Uyuni’s first citizens – railroad workers and army personnel at the military base – rendering the town’s new cemetery embarrassingly barren for a few years. This was apparently such a problem for the townspeople that they ‘borrowed’ corpses from the nearest mining settlement of Pulacayo until they could produce their own. 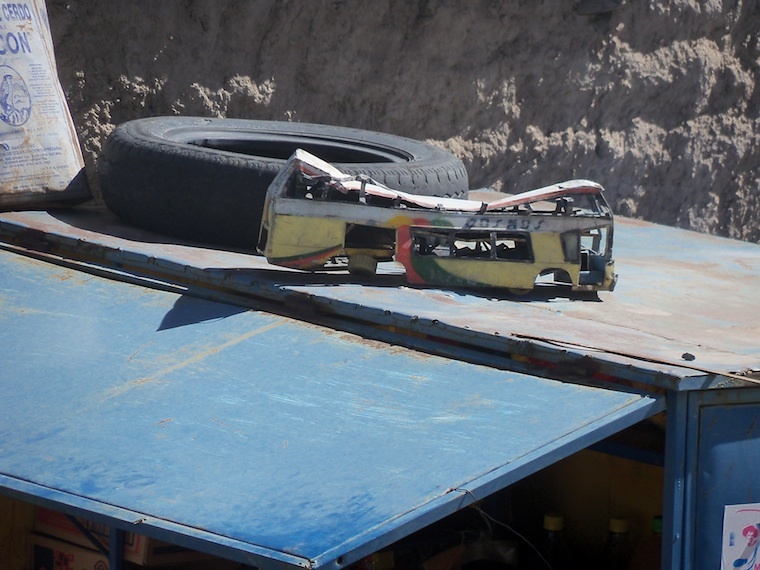 We’ve been trying to leave Uyuni for a couple of days now, but the storm, a transport workers’ strike and blockades on the road north are keeping us hostage. And now the town has run out of gasoline. Our clothes are noticeably heavier with grime, I’m desperate for a shower, for some warmth, but our sorry forays to the bus and train stations have been futile. Bolivia truly is the nation of blockades. Every day, somewhere in the country, a road will be blocked by anything from rocks and logs to sticks of threatening dynamite. It disrupts travel, hinders the transport of people, goods and trade, leads to produce rotting at the side of the highway while people go hungry waiting and prevents medication reaching those in need. 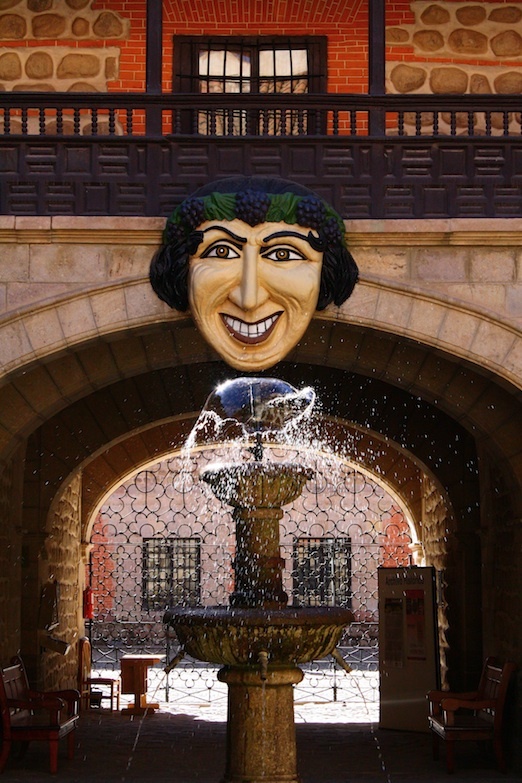 But as a political tool, it’s had some impressive successes here, including the Cochabamba blockades of 2000 that restored the region’s water into public ownership, after a 1990s sell-off that involved price hikes that made the basic necessity unaffordable (read more here). My empathy and understanding for the peasants’ cause is waning somewhat. Last week, we spent a few days trying to get from Potosí to beautiful Tupiza, prevented again by blockades and other disturbances. 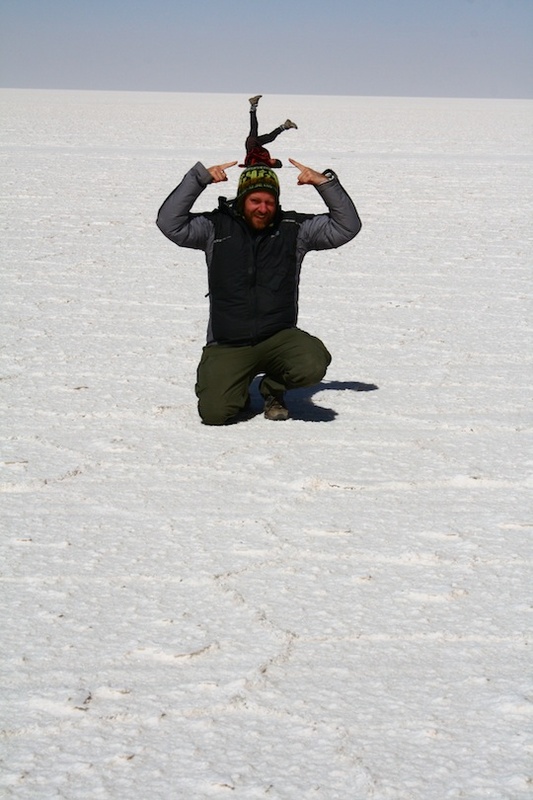 After one particularly memorable morning, in which we rose at 5 am to get to the bus station and then proceeded to spend the next 8.5 hours running with our bags back and forth between various bus stands and the euphemistically named Information Desk, we gave up and decided to skip Tupiza for Uyuni. The extra time we spent in Potosí, in between journeys to and from the bloody bus station, were not unpleasant. 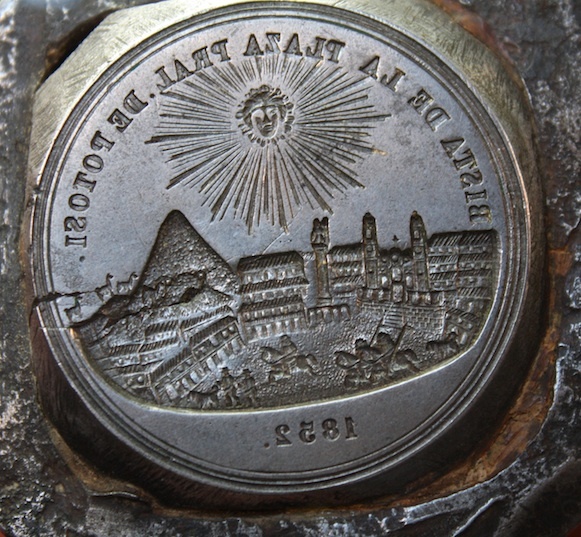 We visited the old mint, which used to supply many of the world’s coins – now, Bolivia’s coins are made elsewhere and imported. The building is a grand design housing some wonderful paintings, a great collection of minerals and some fantastically macabre mummies, many with cranial deformation – the more noble your birth, the more pointy your head. 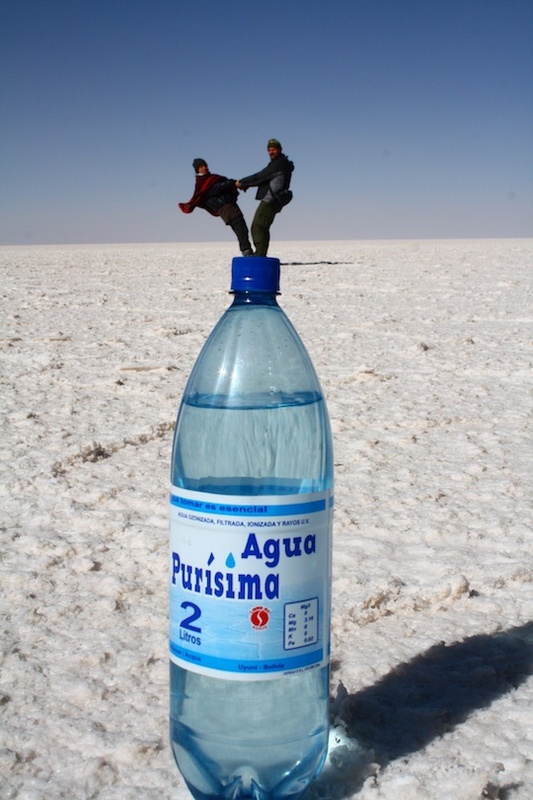 We leave Potosí eventually, arriving 8 hours later in Uyuni, excited to be on our way. In the morning, we join 6 other tourists – a 19 yr old English boy, a young Dutch girl and a slightly older Swiss couple. 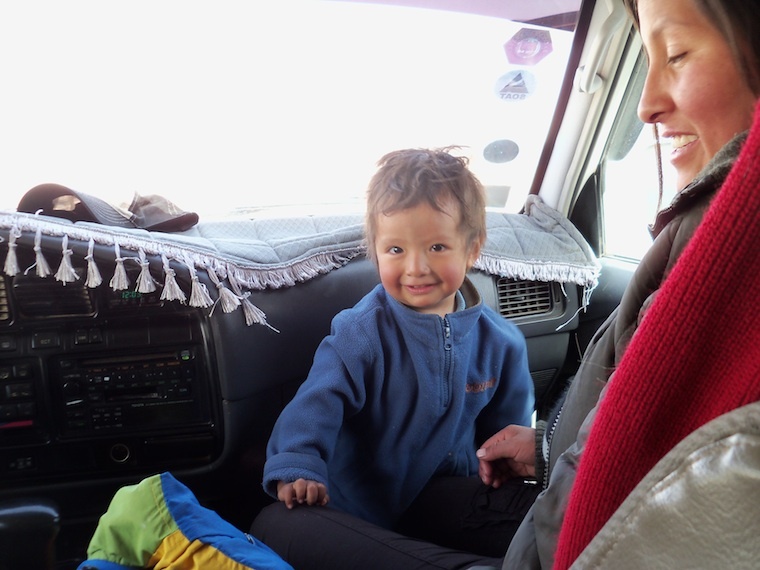 We squeeze into the back of a LandCruiser jeep driven by an Uyuni-born guide, who is accompanied by his wife and toddler in the front passenger seat. We head off into the increasingly ferocious winds, leaving the town and its kilometre-wide plastic-bag strewn halo. Then we are in the desert. 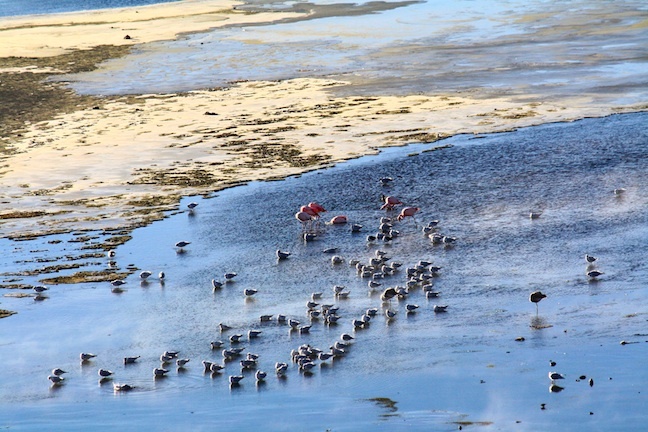 We drive through icy streams and over frozen ground, casting a sympathetic glance at the few flamingos that remain here, too young to have the strength to join their parents in warmer lakes. 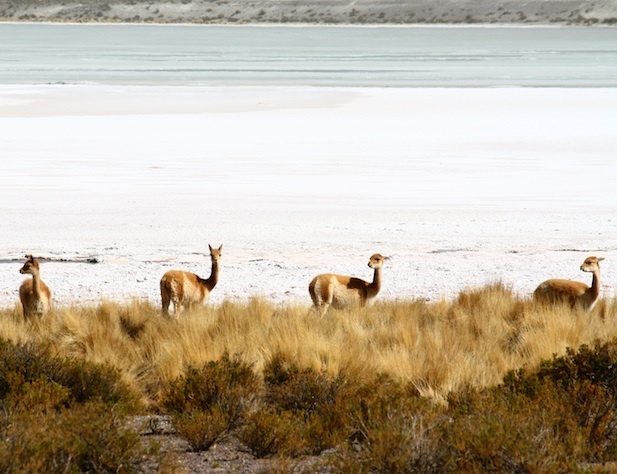 Golden vicuña, the wild ancestors of domesticated camelids like llama, leap in alarm as we break the horizon with our shiny steel can. We pass the world’s second biggest mine (the continent’s biggest), San Cristobel, which turns over 100,000 tons of dirt a day, exporting mainly silver and zinc. New houses huddle around a 17th century Jesuit church, which was moved here brick by brick when the villagers reluctantly relocated from their higher site. 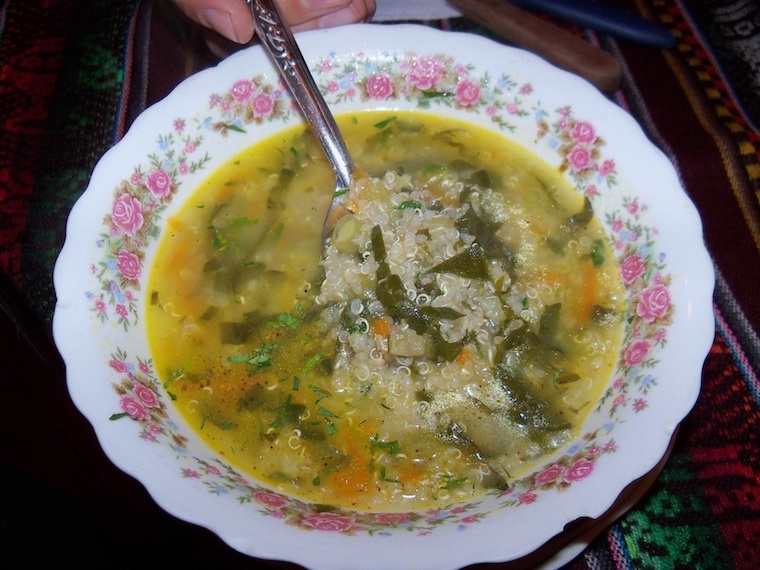 We take our lunch at 4000 metres up in the 900-strong village of Villa Mar, named, despite its location in the middle of a desert, in honour of the Bolivian coast lost to Chile in the War of the Pacific. 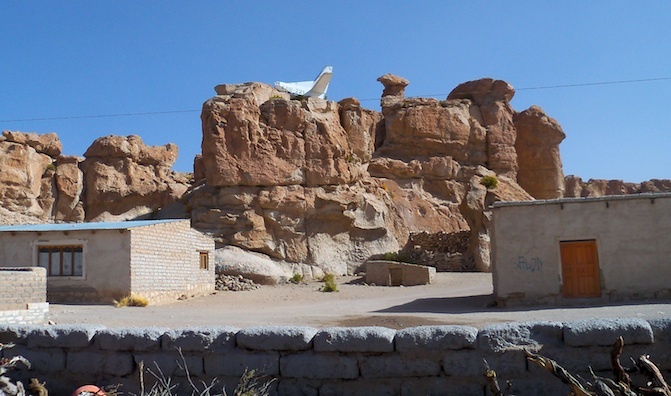 Pre-Incan rock paintings adorn the surrounding cliff-face, but more eye-catching is the fuselage of a wrecked plane perched on top of the cliff, swaying alarmingly in the wind. It’s a dusty, forlorn place where smiling earns you a mouth full of grit, and we are glad to leave, driving further into the emptiness. 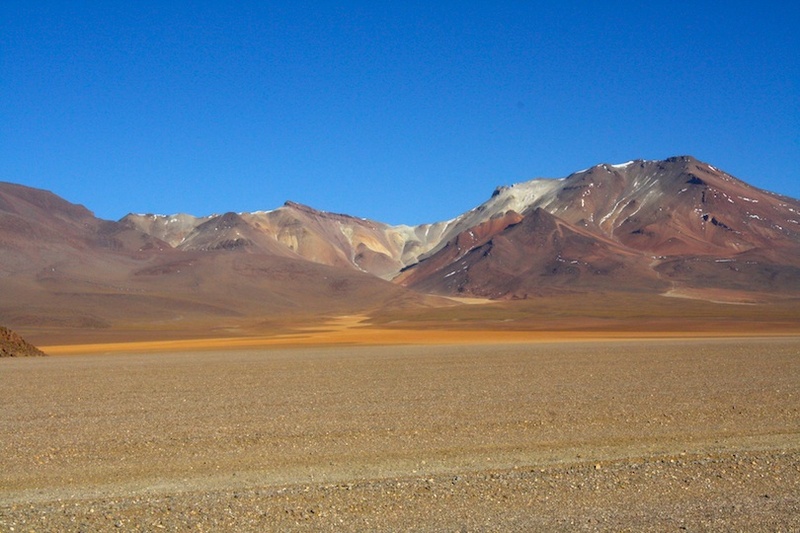 The landscapes are big and brutal here: wind-sculpted rocks stand incongruously against earth and sky; volcanoes crown the horizon in fantastic colours, their ancient lava petrified where it spilled in foamy release; and the minerals of this planet are laid bare and bright, naked in the absence of vegetation. 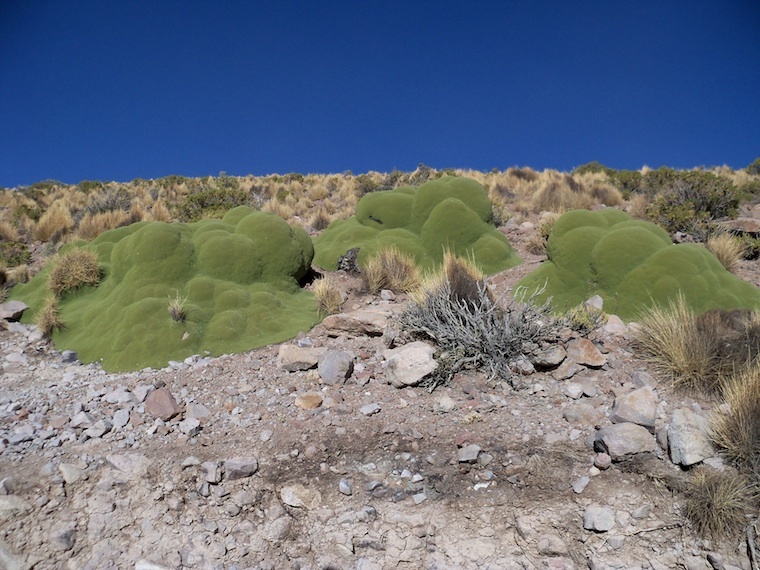 Every few kilometres the landscape transforms utterly. We stop every few hours and unfurl from the jeep to look at a new marvel, emerging into the minus 20 degree winds that steal our breath and shock us quickly back into the car. 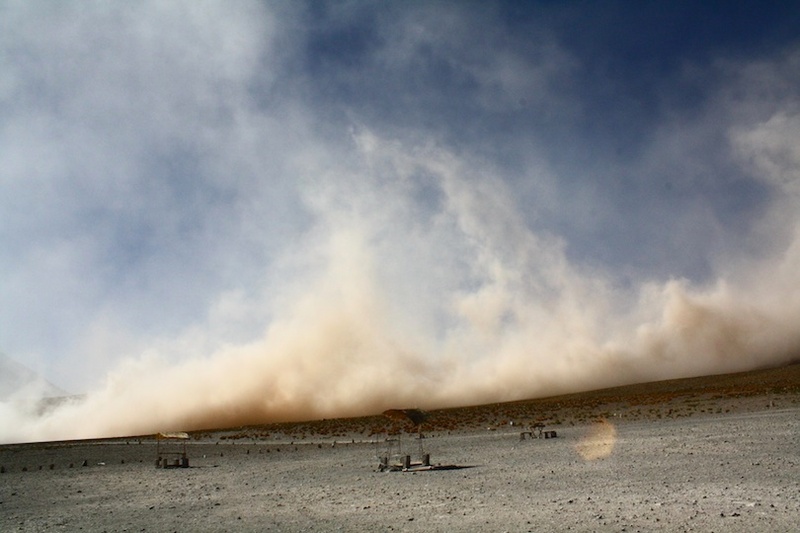 By the time we reach the Lago Colarado, near the Chilean and Argentine borders, the conditions have turned frightening. The winds are hurling pebbles at the car and I am nervous we will be blown into the frozen water below. 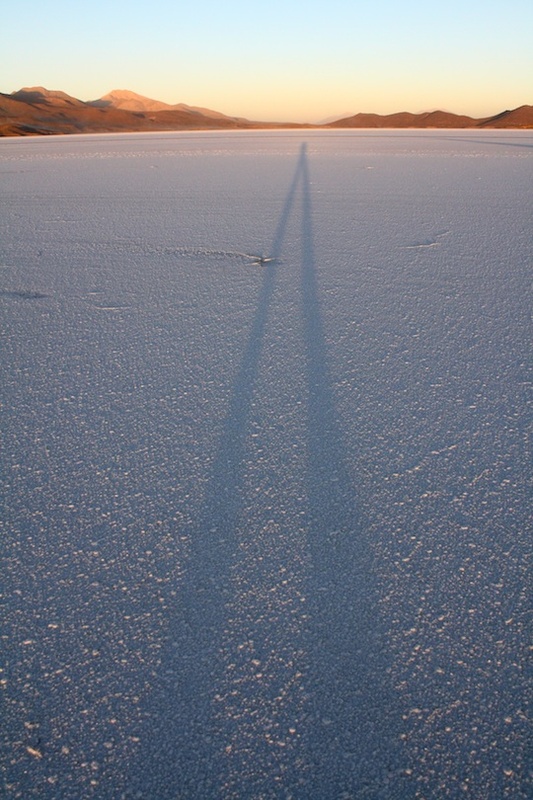 The lake, named for its deep crimson colour, a result of the algae and minerals, is now mostly white – drought, ice and the harsh winds have dried its waters. Sun falls and we head to a nearby refugio, where we spend the night in temperatures of -45 degrees celcius, sleeplessly willing the roof to stay on under the wind’s assault. Morning, and the winds are no less. 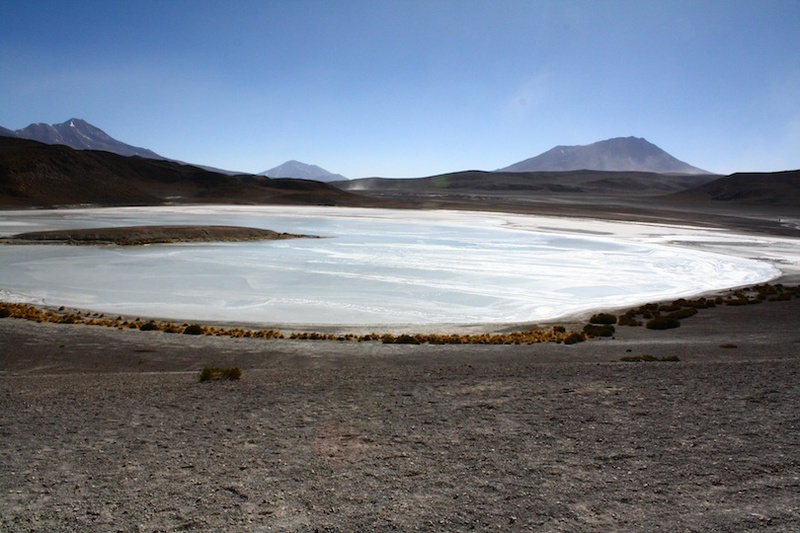 We decide, on the advice of our guide, to skip our planned visit to the hot springs, geysers and, most regrettably, the Green Lake, because it’s too dangerous to drive south into the winds. Instead, we head north with the wind behind us, sitting scrunched in the jeep, nursing chillblains and a new headcold. 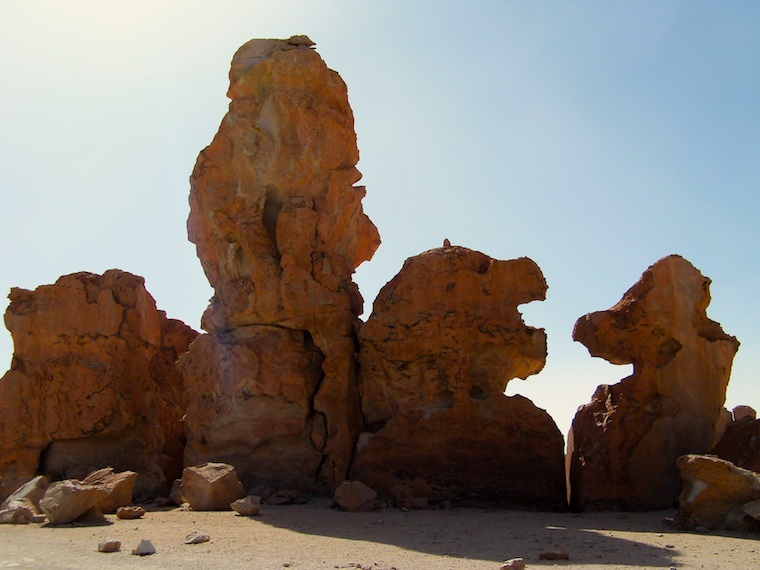 The landscape continues its ever-changing show of incredible beauty. We pass salt flats of borax, being mined for export, the wind casting veils of white dust over their shimmering expanses; lakes glassy with ice and spiked with crystals of algae and salts; a terracotta backdrop of mountains and volcanoes, the biggest of which, Licancabur, is so alien that Nasa tested its Mars Rover in its crater. 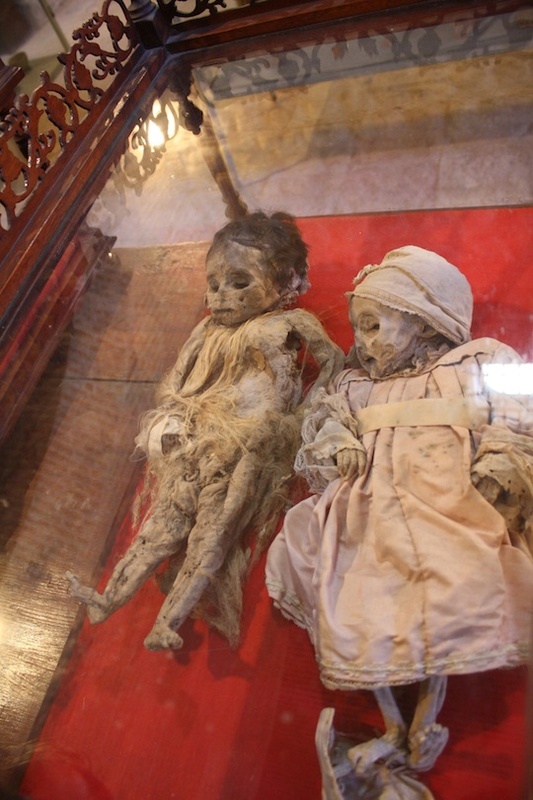 In that same crater, 5916 metres up, were found the mummified corpses of sacrificed young girls, which the Incas sent there to freeze to death. We pass the small quinua-growing village of San Juan, another ancient habitation that’s relocating elsewhere because climate change has robbed them of the rains that allow them to make food from the earth here. 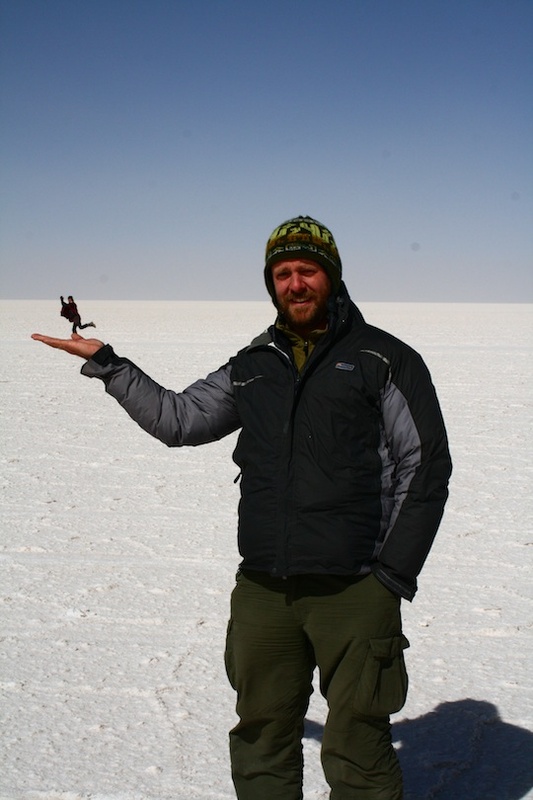 By afternoon, we reach a small salt hotel on the edge of the salar and stop for the night. 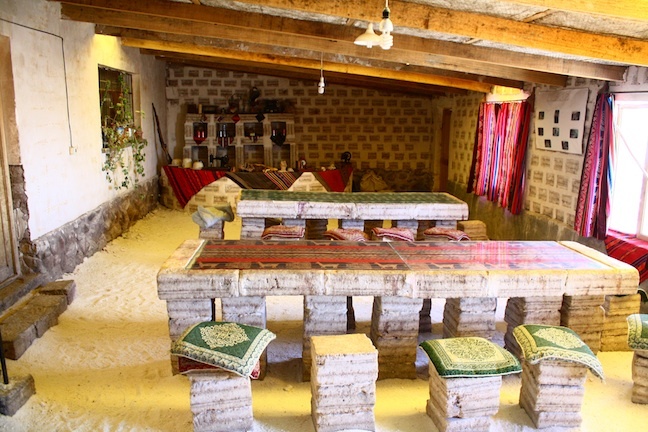 It’s a homely place with textile tablecloths and curtains, and it’s a million times better than the poor shed we slept in the previous night so our spirits rise as a group. We head to a nearby grotto called the Galaxy Cave, formed by the explosion of hot lava into a freezing lake. A tiny Aymara man in his eighties strings lights through the cavern to illuminate the lacy spider’s web of petrified lava froth. A small shrine to Pachamama, the earth goddess, is at the far end. 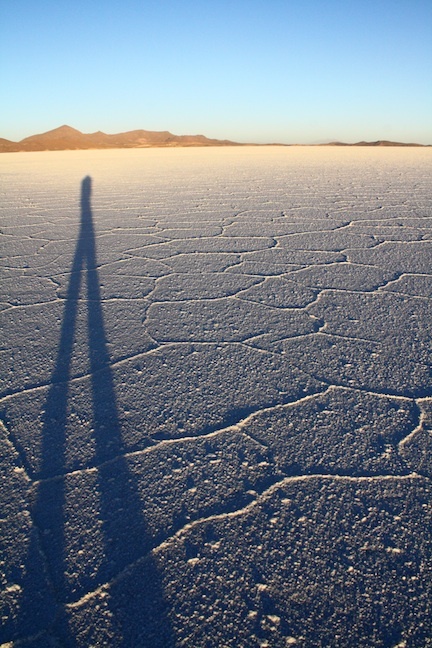 After a better night’s rest, we rise before dawn and drive into the surreal landscape of the world’s biggest salt flat. At 12,000 square kilometres, it’s the size of a small country, the size of a sea – which it was once. 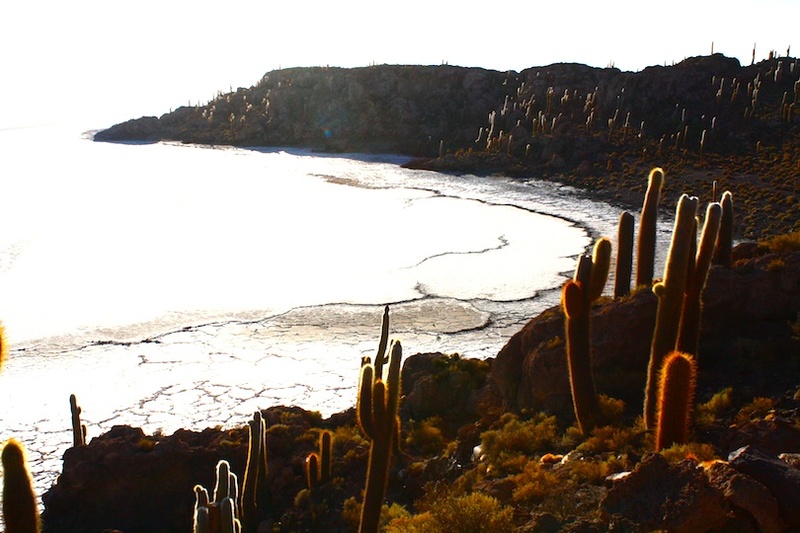 Many years ago, the Atlantic Ocean flowed from present-day Argentina as far west as La Paz in a huge channel. Land eventually sealed off this liquid ingression from the ocean, creating a vast interior lake. 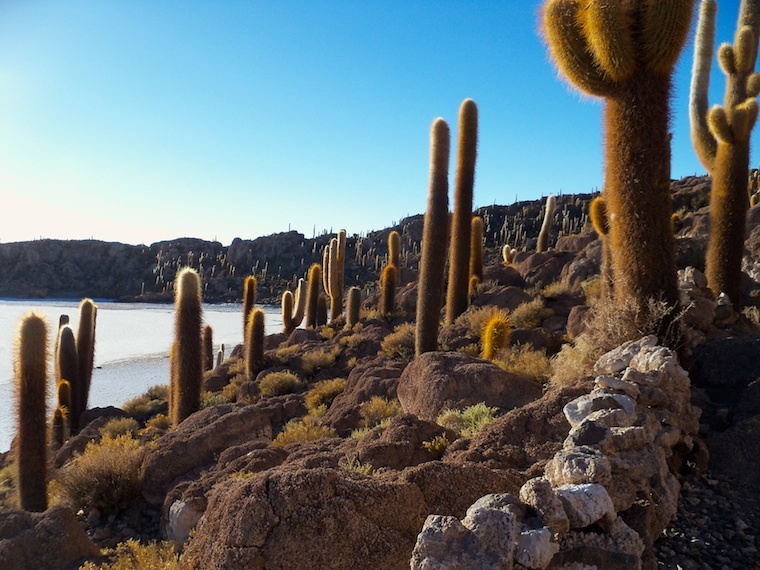 The clash of tectonic plates that created the Andes forced the lake higher, where, over time, it evaporated producing this incredible expanse of brilliant white salt. The sea of white, hemmed by the azure sky is unlike anything I’ve experienced and my eyes are confused by the enormity of it. 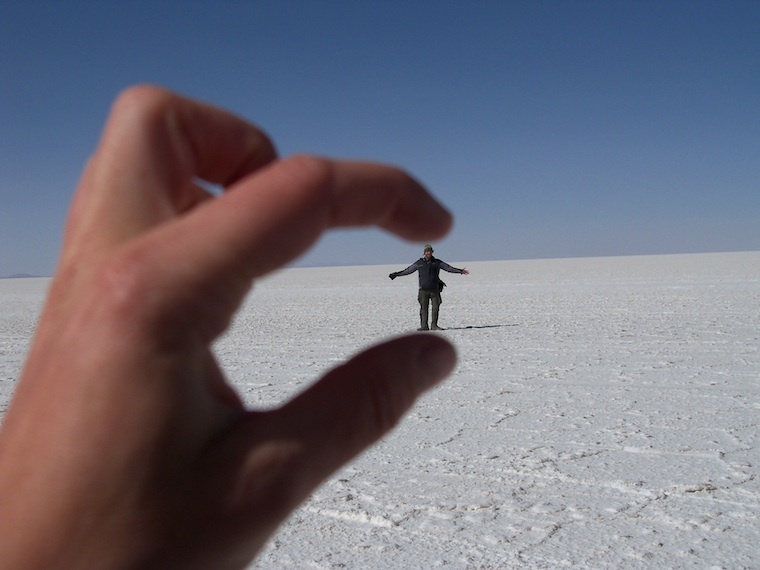 Perspectives are distorted and it becomes impossible to gage how near or far, big or small something is. We play tricks with the camera, failing to create the perfect illusion because the terrible wind and cold makes it impossible to spend time manipulating the focus. But it’s fun – the white and blue make a perfect photographer’s studio. 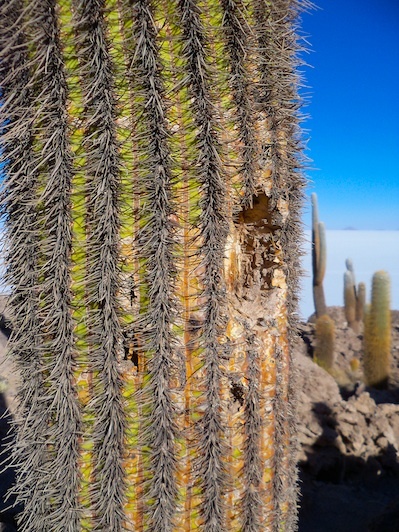 In the distance, we see a small island in the salar and, on approaching, discover it to be alive with more than 6000 cacti. 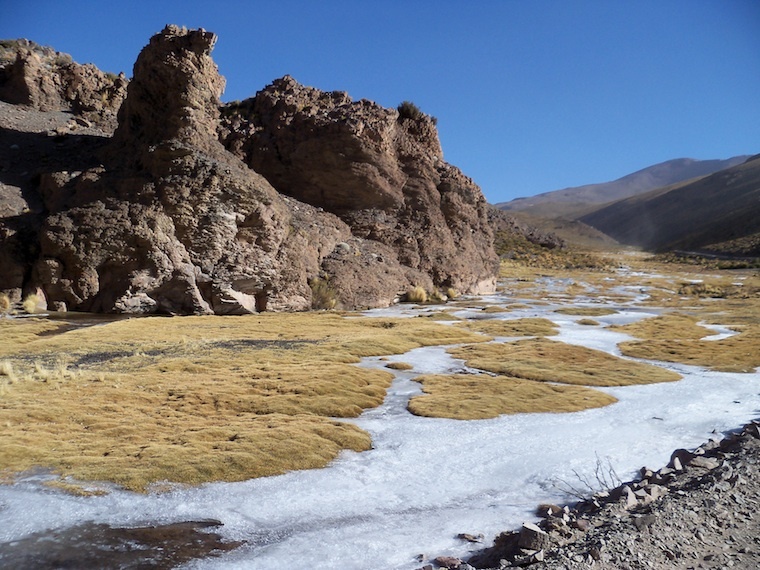 This is Incahuasi island, an unreal place of gold and green in the deathly white salar, and a place of refuge for the Incans who once crossed these flats with their llama trains. 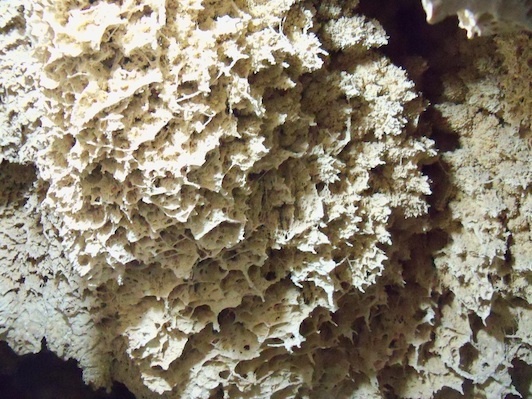 At the heart of the island, which is an atoll of fossilised algae and coral, stands a small ceremonial centre and a 35-metre-deep gorge which once held precious freshwater. 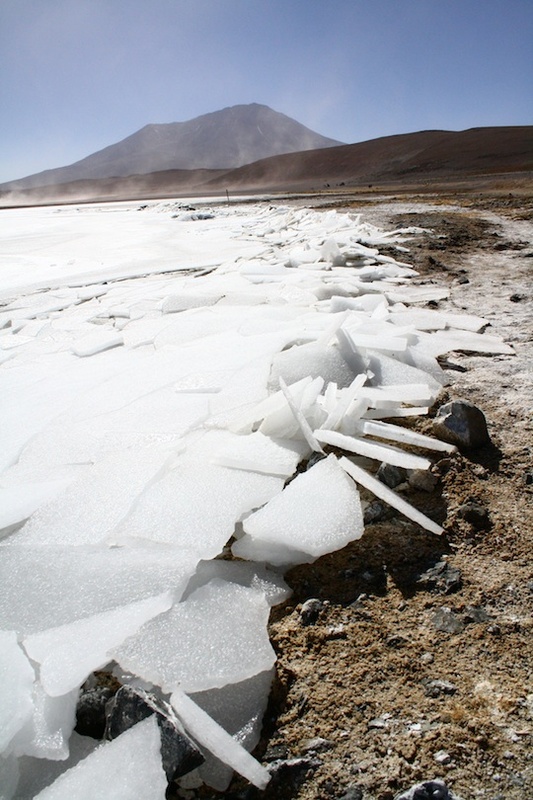 The salar is tessellated with polygons, cracks in the 5 metre deep salt layer down to an underground lake beneath. Capillary action drives lake water up through the cracks where it crystalises at the surface forming ridges. In many places, the tessellations are disturbed by large ‘pools’ of salt. 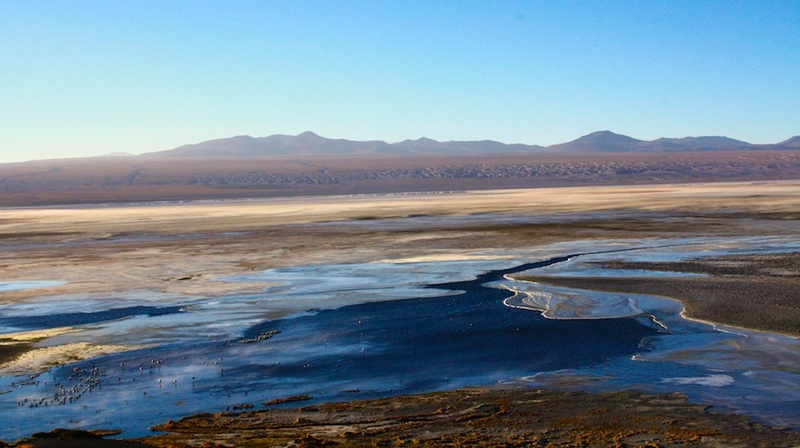 These are the ‘eyes’ of the salar, where water is nearer the surface, and lethal patches for those who drive over them. 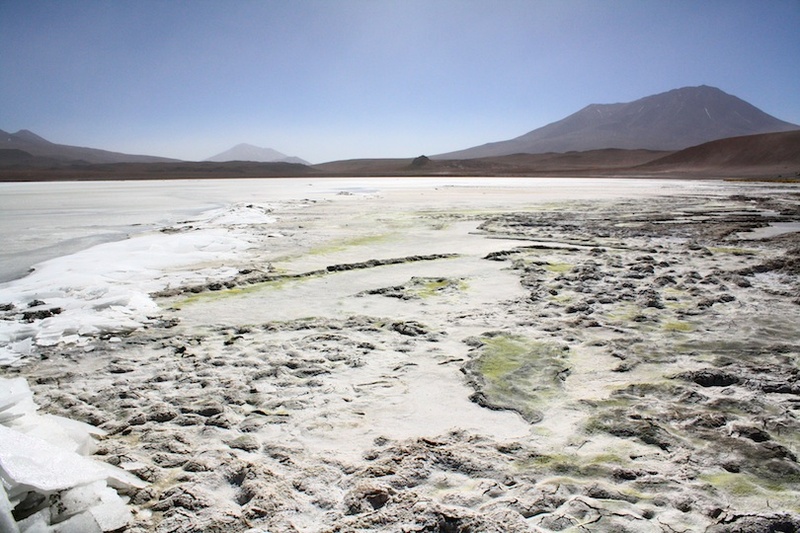 In time, we cross the salar and reach the salt-mining community of Colchani. 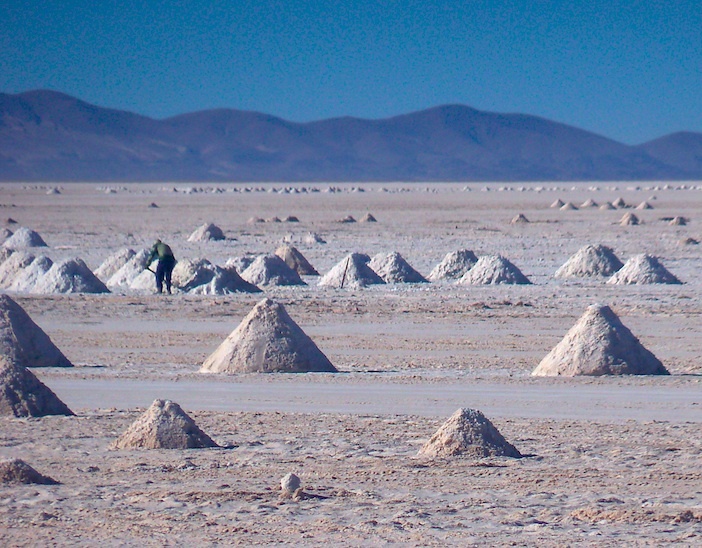 Hunched men and boys with pickaxes and shovels carve up the salt by hand, piling the white ground into conical heaps, where it dries and is transported out by truck. It’s back-breaking work in the freezing wind and blinding sun. Boys paint their faces with charcoal to dull the reflection and help spare their sight, but the old men are unpainted, burnt as bark, their eyes milky with cataracts. 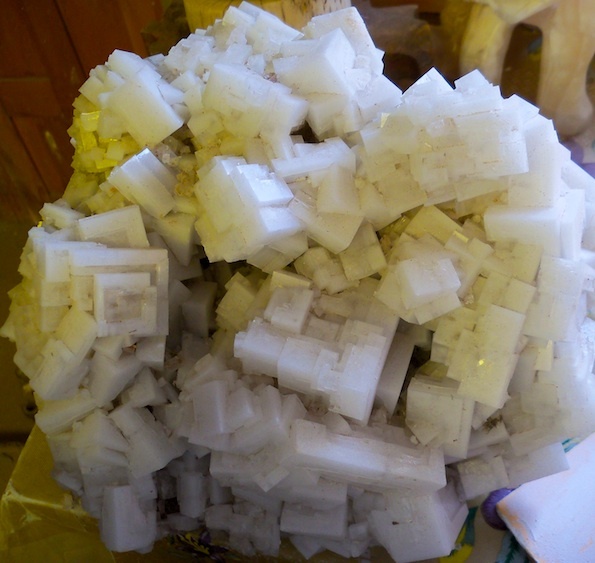 More than 20,000 tons of table salt is produced annually from this ‘Puerto Seco’ (Dry Port) of Colchani, but the white stuff is more than a seasoning. 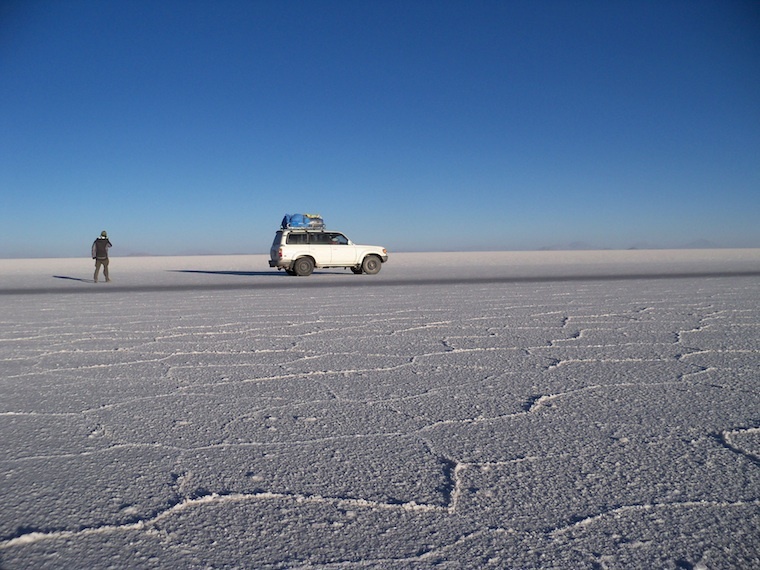 The Uyuni Salar holds more than half of the world’s supply of lithium, a light metal that is used in mobile phone, laptop and camera batteries, and which is essential for the efficient, quick-to-recharge batteries of the oil-avoiding electric and hybrid cars of the future. 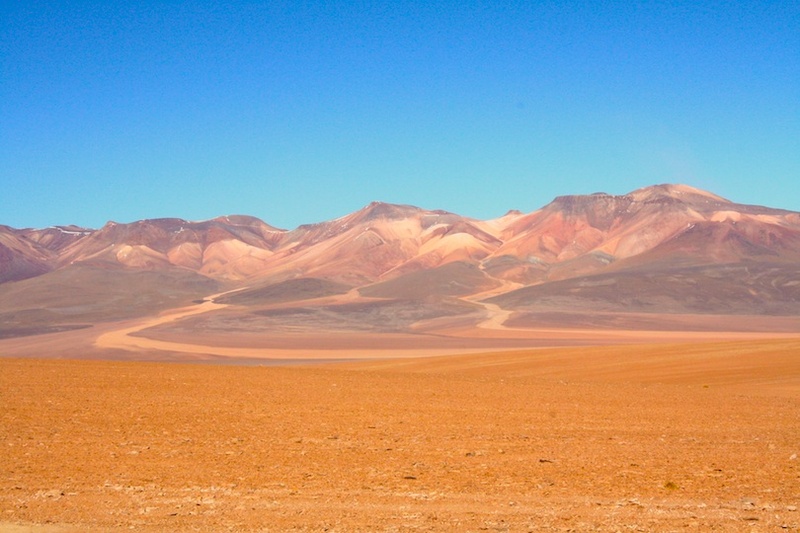 If Bolivia could somehow tap into the lithium production market, the impoverished country would finally be rich. At least, that’s what President Evo Morales is hoping. It’s an exciting prospect, and everyone from Japan to France wants in on the act. 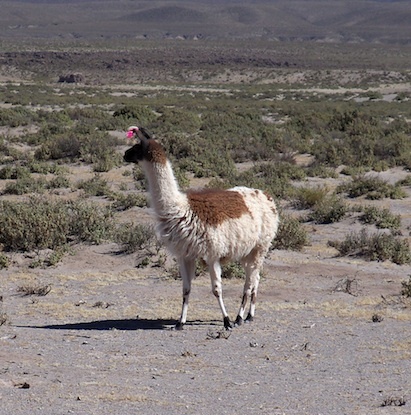 But history has not been kind to Bolivia. The country, one of the continent’s richest in terms of natural resources, is home to many of the poorest people, largely because of the way that foreigners have exploited these lands for everything from gold to silver. 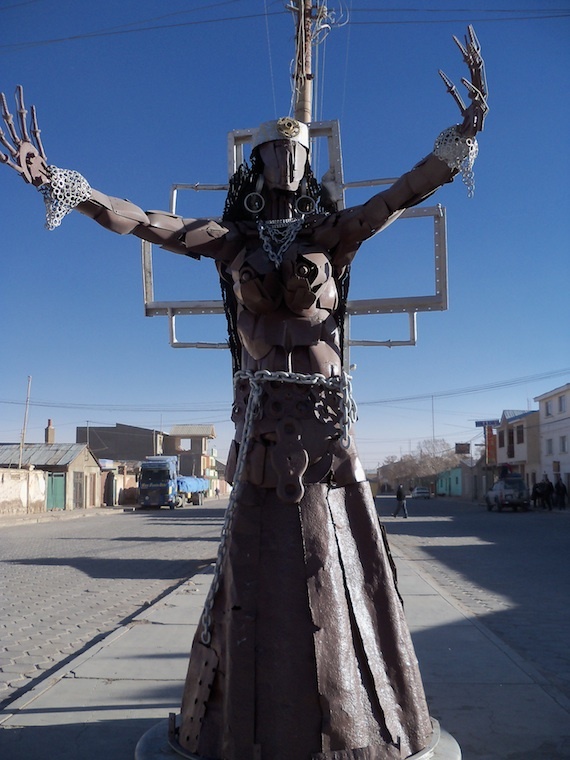 Evo is so far refusing to let this precious new find out Bolivian state control. 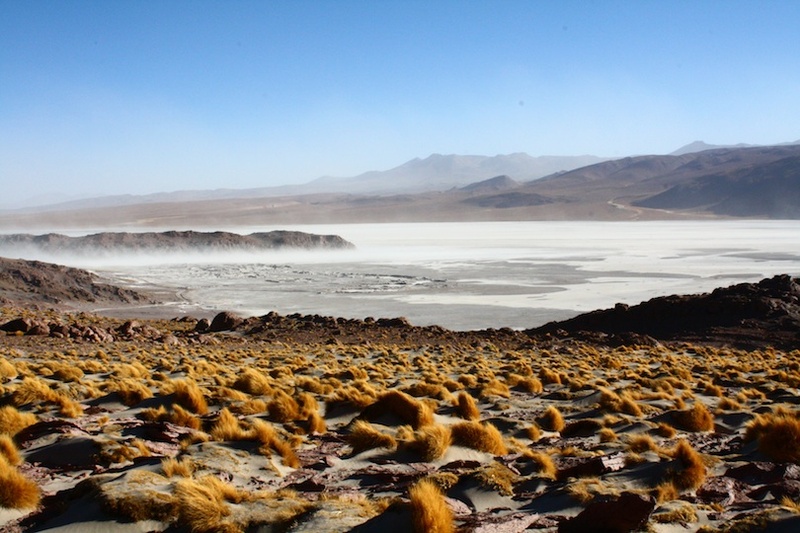 He’s set up a pilot project to extract lithium from the salar and is trying to process 1200 tons per year at first, rising to 30,000 tons a year by 2012. 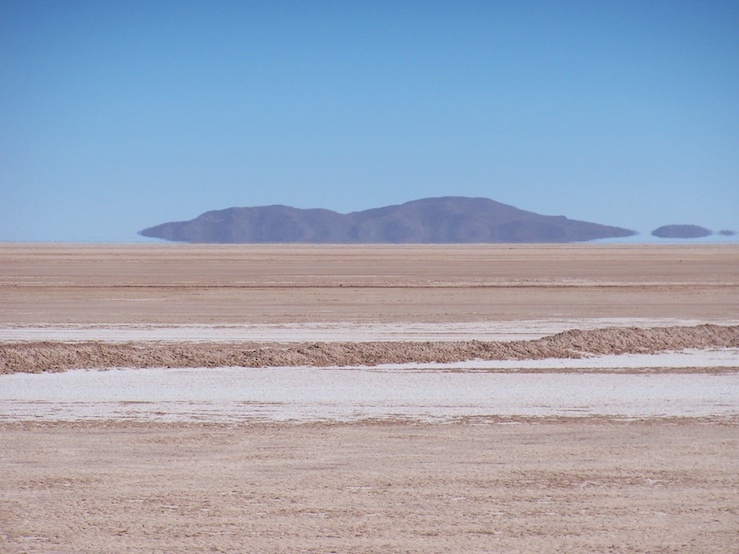 Sceptics say that Bolivia lacks the knowhow and infrastructure to extract lithium efficiently, certainly in the quantities needed – around 500,000 tons a year to supply a small market, car manufacturers estimate. But if the pilot project works, the nation may well become the Saudi of lithium. It’s while we’re passing through Colchani that the winds take a more violent twist. 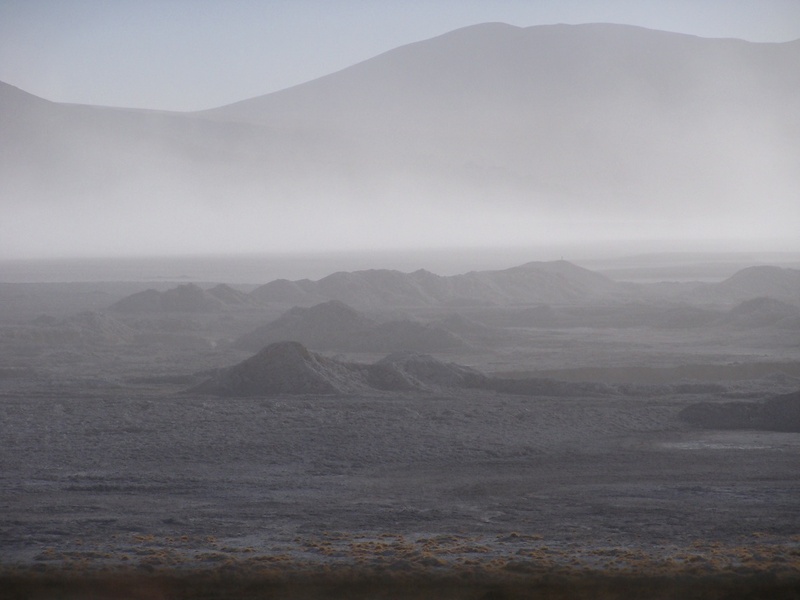 By the time we drive into Uyuni, the town has disappeared in a blinding blanket of swirling dust. After a some days, we emerge from our hostel cell to inspect the aftermath of the storm. The few trees are ensnared by garbage, a thick layer of dust coats everything so that the entire town is in brown monotone. 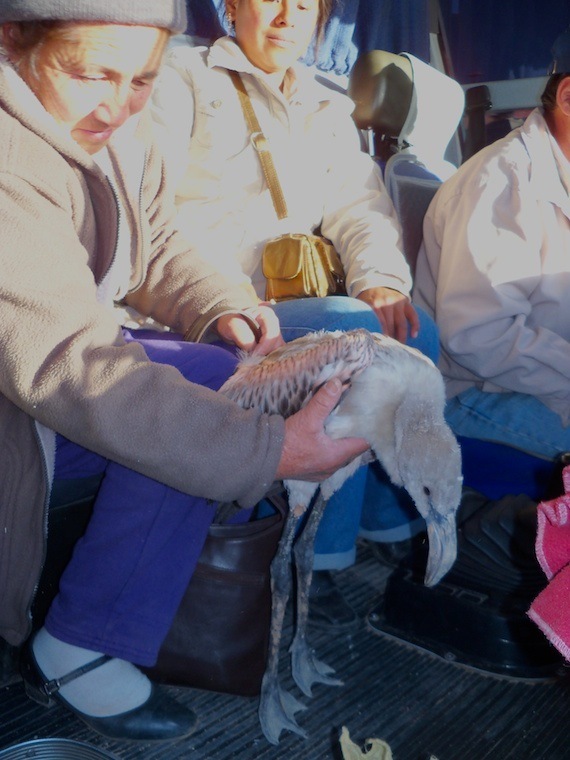 In the main square, people are rescuing flamingos blown there with broken wings. There is still no power, no water, no diesel. We seek refuge in a small cafe run by a Boston man, who makes superb pizza and pasta dishes. Chris has lived here for 9 years with his Bolivian wife. You moved here from Boston, I ask, amazed. 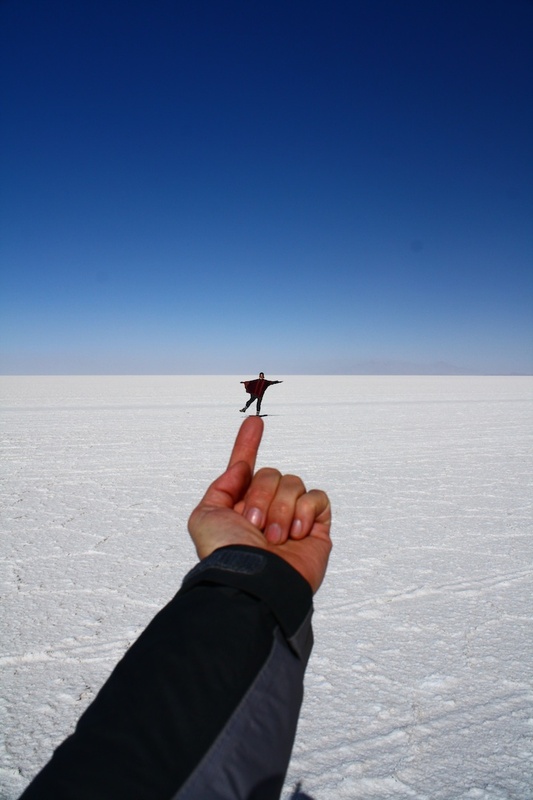 I’ve never been to Boston, but if it’s worse than Uyuni, I’m never going. Amazing post! Such a stunning combination of pictures, writing and information. You really gave me a sense of what it’s like. 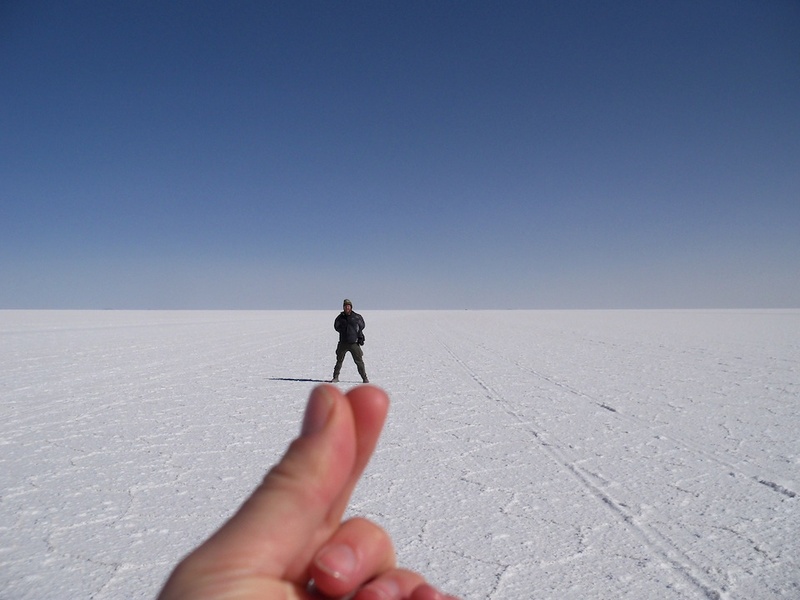 I hope you get out of Uyuni soon. Sounds like not much has changed in Bolivia, travelled through heading east into the pantanal in the late 80s, same confusion and stuff marooned in Corumba for a while. Great post . Good luck for the next stage ! 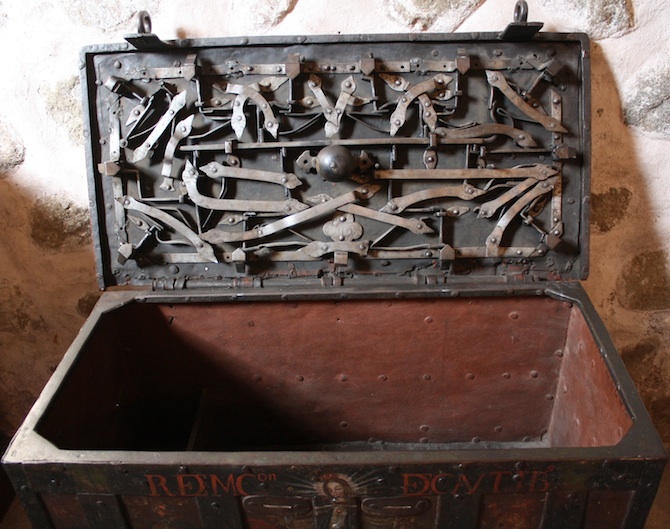 Thanks Richard – yeah, I doubt it’s changed much! Incredible journey, wonderfully painted – glad your safe! Wonderful post – the words and pictures say it all. Must come back and read the rest of your posts, as I only just discovered your blog this morning after following a link from Keeper of the Snails. 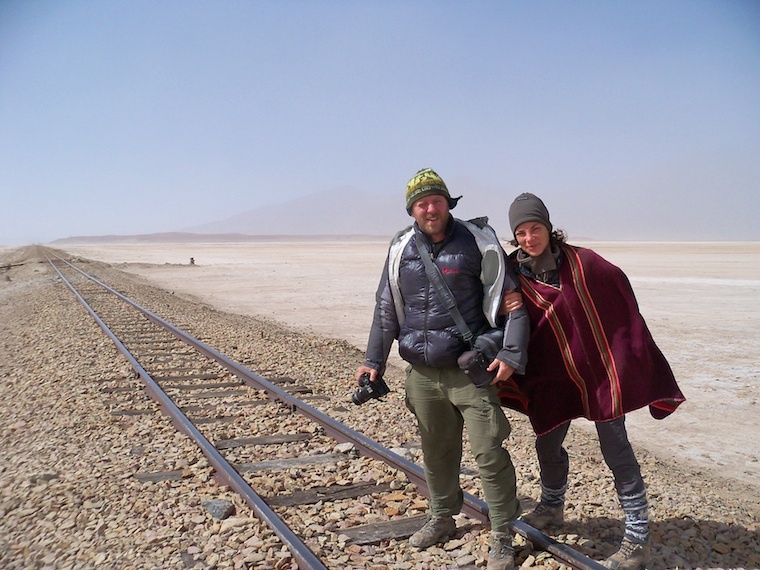 Would you happen to know anything about the tourists who didn’t survive the Uyuni tour? 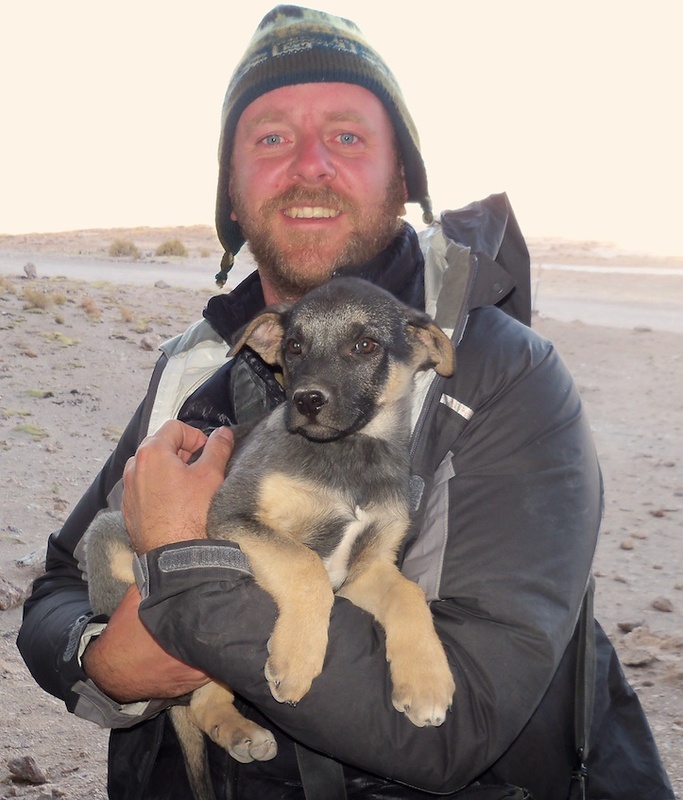 Hi jan, I only know of these four through speaking to other tourists I’ve met in La Paz, who were on tours with them. Unfortunately, there may well be others. 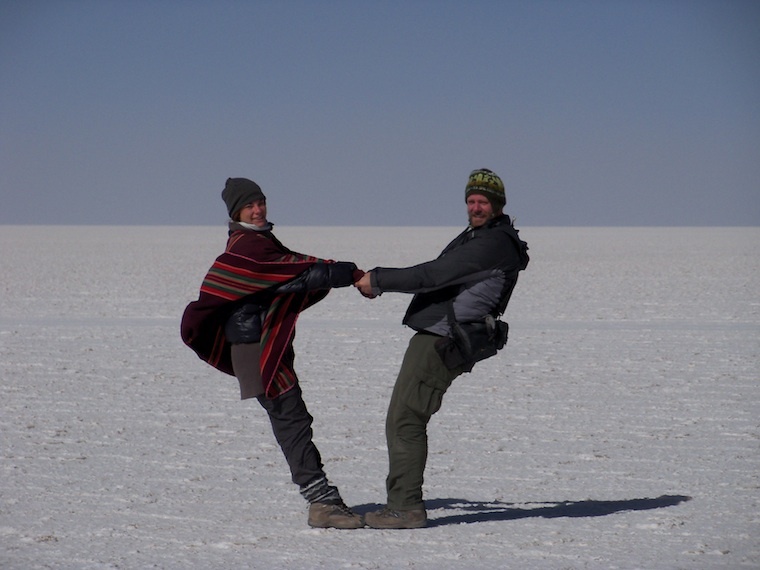 I’ve also heard that there were fatalities among people who got stuck in the salar over the last few days, although not how many or who. It’s a shocking situation. Some drivers set off without adequate fuel, with poorly maintained vehicles and without enough water or supplies. Wonderful, as ever! Are you going to be writing a b0ok about your travels, Gaia? The evidence of climate change in this post and, in particular, the post about the former ski resort is horrifying but the descriptions and photos are unmissable. 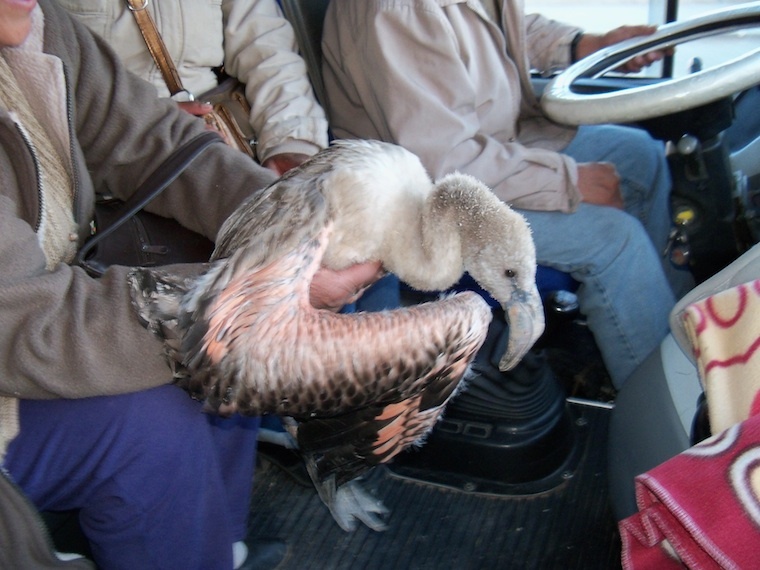 Hi what happend to the flamingo on the bus? where the locals rescuing them or were they destined for dinner? Hi Arthur, they’re rescuing it (I hope!) Flamingoes are protected.